Home » Blogs » David Gauntlett's blog » What is Digital DIY? This post originally appeared on David Gauntlett's personal blog, on 6 February 2015. In January we had the ‘kick-off meeting’ for our EU funded project, ‘Digital DIY’. (An introductory post about the project appears here). The team – pictured above! – gathered at Università Carlo Cattaneo (LIUC – they say “lee-ook”), near Milan, Italy, where our project co-ordinator, the genial Luca Mari, is based. 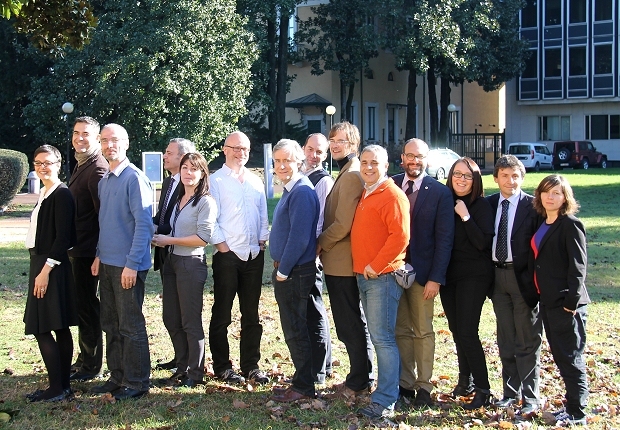 All seven international partner institutions were represented there, and we are a properly interdisciplinary group, including designers, a philosopher, politics and business studies people, technology scholars, a sort of sociologist (me), and Luca himself is a well-established scientist with a strong interest in communities of creative people. Some aspects of EU funded projects can come with impenetrable jargon, so I was pleased to see that the thing which I would call the kick-off meeting was actually called the ‘kick-off meeting’. And candid communication characterised the whole thing. We needed to sort out all kinds of logistics, but we also had to consider questions such as: What precisely is our project about? Don’t worry, EU funders! We all agreed on a large patch of central stuff, and on everything presented in the application. But the potential definition of ‘Digital DIY’ is fuzzy, and there is lots of room for discussion. In short, some of us think that ‘Digital DIY’ should refer to any kind of do-it-yourself creative activities which are changed or boosted by the existence of digital tools (such as the internet). And some of the group would define it more narrowly as physical things made using digital tools – things like 3D printing and Arduino. This second definition appears more focused and straightforward, but I prefer the first one, which is broader and more inclusive. It seems spurious, to me, to include things which are made by a machine connected to the internet, but to exclude things which are made by a person who has been informed and inspired by material on the internet. In my notepad, during the discussion, I wrote: ‘You’re fetishising 3D printers if you think they do something which is sooo much different to people making stuff themselves, by hand, inspiredby [things on] the internet’. Our philosopher raised the question of music – I think it came up when he casually mentioned that obviously music isn’t included. But why is music not included?! That didn’t seem to make sense. Making, and then distributing or selling, recorded music is a kind of archetypal ‘digital DIY’ thing – because in the past, as we all know, it was very difficult and slow and expensive to do, and you needed professional studios and a record company and their distribution and marketing and selling operations, or you typically couldn’t get anywhere. And now, you don’thave to have any of those things, and you can do all of that on a laptop in your bedroom. Classic (digital) DIY, isn’t it. As another point it was mentioned that we would be able to recognise a product of digital DIY because it was something you could put on the table – and would break if you pushed it off. This was neat in terms of clarity, but I immediately knew we couldn’t be having that, as it excludes not only music but also any number of soft, cute, squishy or wearable kinds of things which are innovative fruits of digital DIY. Hmm! We will be obliged to agree on answers to some of these definitional questions, soon. That’s OK! I think we can! And it’s a very interesting conversation.